“As the afternoon sun shone on the barn rooftops and the storm clouds gathered on the horizon, community members gathered together to discuss plans for a mosque in Nokesville on Aug. 12. “The site, which is likely to continue to generate controversy over the next few months, is a 14-acre tract of land at 12655 Vint Hill Road. “The All Dulles Area Muslim Society, known as ADAMS, met with neighbors at the Nokesville Volunteer Fire Department last week to discuss plans to build the 22,000-square foot ADAMS Greater Gainesville Masjid and Islamic Community Center on the site. “The Prince William Board of County Supervisors, including Supervisor Wally Covington who was present at the meeting, will have final say on whether the use fits the property. “Covington stressed transportation is the largest issue facing the project. While repairs will be coming to Vint Hill Road in the next few years, Covington said he didn’t see anything on Schafer Lane in terms of funding. 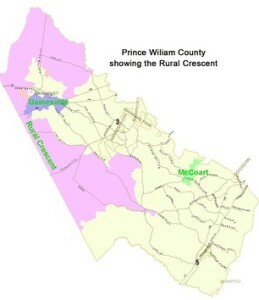 “Prince William County has denied permission to exit onto Vint Hill Road so the mosque would front to 2125 Schafer Lane. “The property, which at once time was assessed at $522,900, has a currently assessed market value of $232,100 according to the Prince William County real estate assessment. “Because the property is zoned for agricultural use, owners would need an obtain a special use permit for a building of this size in the Rural Crescent. The project has been reviewed once. “Peter Dolan, a land use and zoning lawyer, knew the issues his client were up against and came prepared. Dolan and Jonelle Sanders Walker, attorneys for Walsh Colucci Lubeley and Walsh, opened the meeting with a brief Power Point about the proposed building. “The property currently owned by the New Hope Christian Church of Manassas is under contract to ADAMS with a continuance clause for the special use permit. Prior to New Hope Christian Church obtaining the land in 2012, the property belonged to Antioch Church of Christ trustees. “ADAMS board member Rizwan Jaka who serves on the board of Interfaith Conference of Metropolitan Washington, introduced audience members and shared the group’s plans before opening the floor to questions. He and other ADAMS representatives were peppered with questions from how many women are key members to what is the religious holiday Eid. “In the end, the meeting was primarily about homeowners’ concerns regarding property values and traffic. ” ‘I can’t get out of my driveway anymore,’ said a woman who lives directly across from the proposed mosque on the tiny lane that was flooded that day from the rains. ” ‘All the locals will be hosed’ announced Michael Ochs who lives on Schafer. ” ‘Why did you focus on Vint Hill and Schafer Lane,’ asked an elderly woman. “Stepping up, Walker said the reason Nokesville was picked is because the land was available. “Some 80 people, most of whom live in the immediate vicinity, engaged in a hour-long discussion over lighting, parking, traffic patterns, noise and wildlife. “Was all of the talk really covering for the elephant in the room? “One local woman felt so and said it. ” ‘Treat us with less suspicion…it’s really bothering me,’ said the woman who wished to remain anonymous when asked her name later. “The woman said while it was not said in the general meeting, she had overheard anti-Muslim remarks around her so she felt she had to speak up. ‘I didn’t say, I didn’t hear anyone say anything about Muslims,’ answered one man in the audience. “While some of the discourse was loud with people talking over others to make their point, no one was openly disparaging about Muslims. Behind the scenes however, the woman was not alone in her assessment. “The meeting was held the same day in which a Manassas mosque was found vandalized with spray paint and a broken window. “Police are investigating that as a possible hate crime but have no conclusive evidence that hate was a motive or that the Nokesville mosque is related. “At the meeting itself, traffic was the primary issue for most residents. “One woman said she didn’t need any more traffic coming through Nokesville. ‘I think it is too small a space … I hope they turn it down,’ she said. ” ‘We are at the beginning stages,’ said Sanders Walker, adding they would listen to questions and concerns and have a follow-up. “Several residents said they were already bombarded with after school traffic on Schafer Lane and they don’t like the possibility of adding hundreds of cars. The facility seats 500. “According to information distributed to the meeting attendees, ADAMS provides religious services, education, and social activities to several thousand people a week throughout the region. The Power Point presentation described a variety of civic activities including one of the largest Cub Scout, Boy Scout and Girl Scout programs in the metro area. ” ‘We have 300-400 families living in the area including Gainesville, Bristow, Nokesville, and Haymarket,’ stated the handouts.